Berkeley, California is as fine a college town as anywhere in the world. The University sets the tone for the city . The University of California, known as Cal is set on the slopes of a mountain rolling away to the east from San Francisco Bay. On most days the Golden Gate and the City are a constant view below. City life, culture, and some of the best restaurants in the world in its “Gourmet Ghetto” (e.g. ; Chez Panisse) are located here. 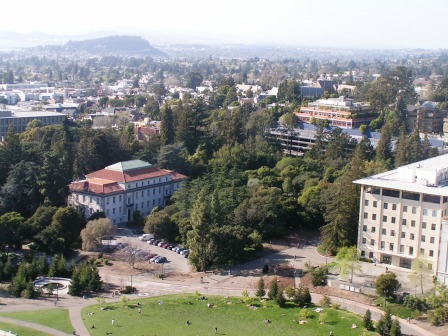 Cal’s campus is set in a beautiful area that mixes old and new buildings amidst a redwood grove. Quiet streets with lush gardens of tropical plantings greet the eye and nose. Meanwhile the climate is close to perfect most of the year, rarely too hot, almost never too cool. The University of California, founded in 1868 and one of the world’s great universities, is a big draw for its array of cultural and other activities.